Main Informations: What is Kuchipudi? Kuchipudi is a classical Indian dance form from the southern Indian state of Andhra Pradesh. Kuchipudi is the name of a small village in the Divi taluk of Krishna district. Resident Brahmins practiced the dance and thus place got its name. The wedding dance was during the reign of the Golkonda Sultan Abdul Hassan Tanesha, for her dance performances by Tanesha been endowed with land should be Brahmin as Kuchipudi. Siddhendra Yogi is considered the first teacher to the current form of this dance has taught drama. One of his most famous creations isBhamakalapam. He taught this art of dancing and boys of the Brahmin caste, although it is now dominated by women. Known representatives of Vempati Chinna Satyam's Kuchipudi are, Vedantam Lakshminarayana, Chinta Krishna Murthy, Vedantam Sathya, Narayana Sarma, Mrinalini Sadananda, Venu Gopala Krishna Sarma Pasumarthi, , Nilimma Devi, Anuradha Nehru, Tadepalli Perayya, and Sarala Kumari Ghanta. 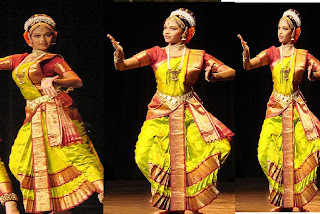 In Chennai, the Academy of Kuchipudi Dance in Arts taught. A performance usually begins with the presentation of the characters. The dancers come here individually to the stage and make her part with a small composition of song and dance (daru) before. Kuchipudi is typical of vocal Carnatic music Accompanies. For the music come south Indian mridangam as instruments Search (Percussion), flute and tambura (stringed instrument that is plucked) are used.